Charge electroscopes, show electrostatic attraction, and more with the contents of this activity kit. 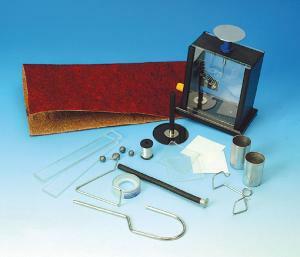 A simple electroscope is included for easily identifying static electricity. A series of other materials including metalized polystyrene spheres, polyethylene tiles, aluminum cans, nylon, PVC, wire, rubber cloth, and wire hook are also supplied for completing electricity experiments.